Govarddhan Puja (November 8, 2018 Thursday) aka Annakut or Annakoot is one of India’s popular festivals. It is the day when devotees prepare and offer a large variety of vegetarian food to Govardhan Hill representing the divinity of Lord Krishna as a sign of thanksgiving. 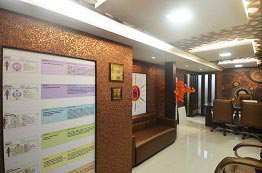 It is celebrated as Bali Pratipada or Bali Padva in the state of Maharashtra. Generally Govardhan Puja falls next day after Diwali and is celebrated as the day when Lord Krishna chastised the heavenly king Indra. Govardhan Puja celebration is suggested during Pratipada Tithi of Kartik (Nov-Dec) month. 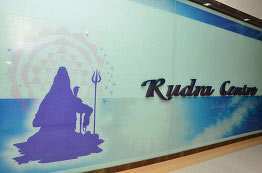 On this day food items made of cereals like wheat, rice, curry of gram flour and leafy vegetables are prepared and offered to Lord Krishna. It is the day when Lord Krishna chastised Lord Indra. When the residents of Vrindavana, requested by Lord Krishna, ceased from performing ritual sacrifices offered to Lord Indra, the heavenly King got furious and brought forth heavy rains. 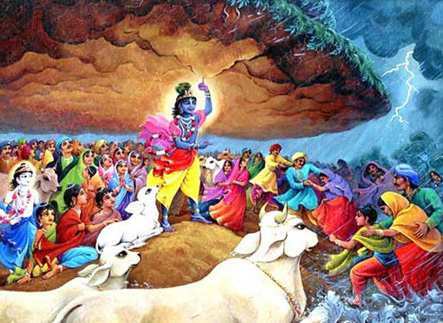 Lord Krishna immediately lifted the Govardhan Hill to shelter all of them against the heavy devastating rains. The Lord told them not to perform rituals for Indra who showers rains on mountains, rivers and seas without expecting anything from them. The Lord convinced His father Nanda Maharaja to forgo the sacrifice to Indra and instead worship Govardhan Hill. He explained to his father Nanda Maharaj This cosmic creation is going on under the influence of three modes of material nature. These modes are goodness, passion and ignorance. The modes as Nature create, maintain and destroy. it is the nature that brings rains. 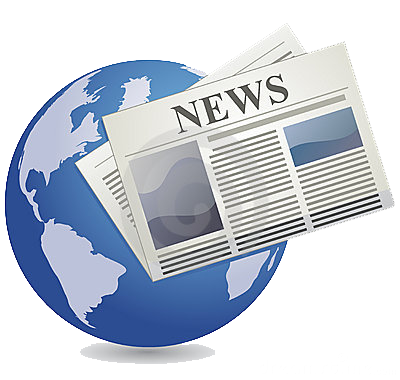 And after the rainfall, all the lives on the earth derive the result—success in agricultural work. What, then, has Indra to do in this affair? Even if you do not please Indra, what can he do? 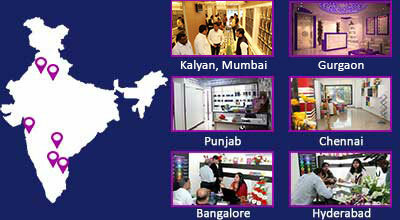 We do not derive any special benefit from Indra. Then, why should the residents of Vrindavana spend so much of their energy, resources on the performance of rituals? Instead of worshipping Indira, they better worship Govardhan Hill. Lord Krishna stood lifting the Hill for seven days as Indra continued the torrential rains all over Vrindavana. When Indra realized that it is the Lord Himself from whom he derives his powers, he at once fell at His feet and apologized. How To Celebrate Govardhan Puja: What to do on this day? What happens on this day? Govardhan Puja is performed during Annakut. There are ways to perform it. One of them is making small mounds of cow dung or dirt representing Mount Govardhan. Those mounds are adorned with flowers and later worshipped by circumambulating around them. Prayers are also made to Lord Govardhan or Krishna. 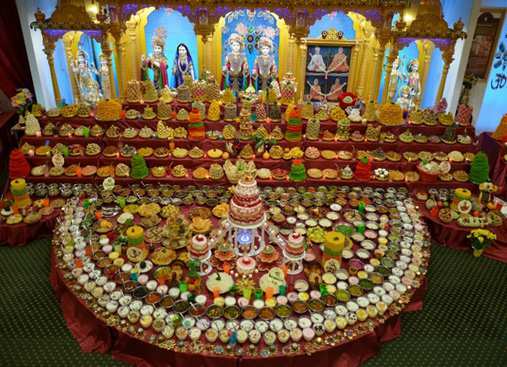 A variety of vegetarian foods is traditionally arranged in tiers right in front of the deities of Lord Vishnu or Krishna with the mound of cooked grains, symbolic of Mount Govardhan in the center and the sweets are placed nearest to the Deities. 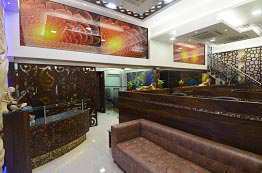 Other foods such as dal, vegetables, pulses and fried savory foods are also offered. 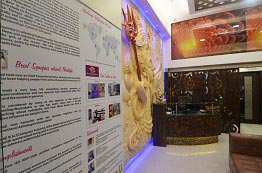 One can simply meditate on Lord Vishnu and chant His mantra: ‘Om Namo Bhagavate Vasudevaya’. This powerful mantra was given by Sage Narada to Dhruva Maharaja as described in the Bhagavat Purana (4.8.54). 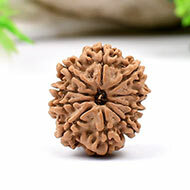 You can wear a Ten Mukhi and a Nineteen Mukhi Rudraksha beads for they are ruled by Lord Krishna and Narayana, respectively. 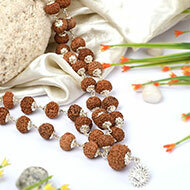 Wearing these Rudraksha beads on this day purifies your inner self and strengthens your will power. 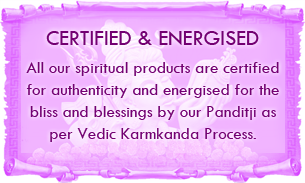 They work like a shield on one's body and the wearer gets immense protection from negative energies, evil eye and psychic attacks.